A letter to Martha Berry from Leleka Smart apologizing for not being acknowledging Martha Berry's earlier letter. Says that that Frank Holden a 2nd Lieutenant who served with her son in the war has written a book, "War Memories." The book mentions her son, Daniel's last sermon while in Europe. Holden is sending a copy of his book to Berry. 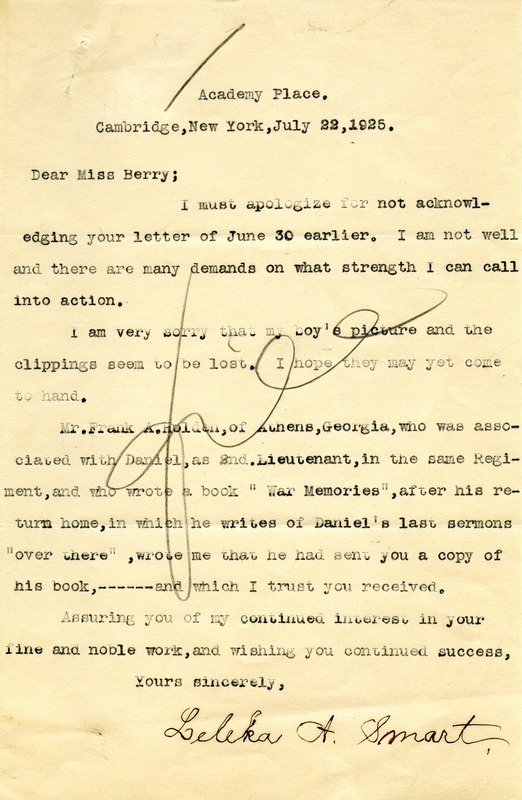 Leleka A Smart, “Letter from Leleka Smart to Martha Berry.” Martha Berry Digital Archive. Eds. Schlitz, Stephanie A., Jordan Brannen, Christy Snider, Avery Gossett, et al. Mount Berry: Berry College, 2012. accessed April 19, 2019, https://mbda.berry.edu/items/show/2827.